I don’t know about you, but when I write (a letter, or anything else), I like to spread my arms out on a table or drawing board. I guess I’m just not one for luxurious living. But this little drop-down desk totally fits the bill for a person of refinement to write a quick note or shopping list. My brother has one from the 1700s and I don’t see how he can even fit a sheet of paper on the writing surface! It’s fine for writing post cards though. The secretary was popularized starting in the mid-1700s and the form endured in popularity through the end of the 1800s. In the 1700s, the form was perfected by French cabinetmakers. When every past style under the sun was revived during the mid- to late 1800s, new life was breathed into it. Robert Horner opened his first store on West 23rd Street in New York. 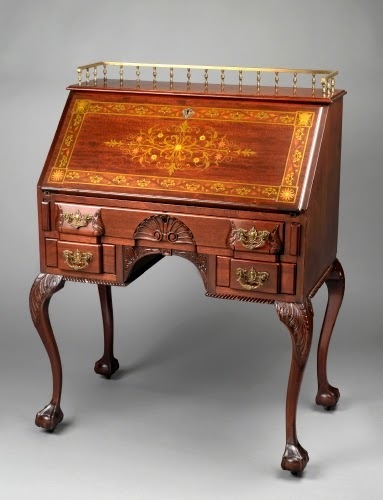 Realizing that the burgeoning middle-class could not afford his “European novelties,” Horner advertised “first-class and medium quality furniture.” At the time he opened, his furniture was produced on site, using mahogany, oak, and other hardwoods. His artists decorated the furniture in all of the popular revival style carving motifs of the day, sometimes verging on being overly decorated. In 1891 Horner began to import European-produced revival styles while continuing to produce pieces in New York in the latest fashions. Major revival styles he featured in his showrooms were Louis XV, Louis XVI, Baroque, and Mannerism Revival. 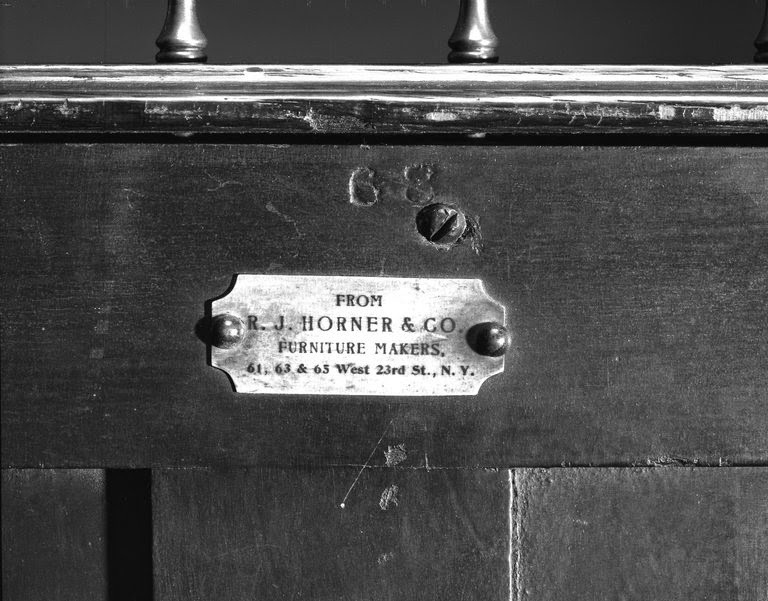 Horner’s company survived the Financial Panic of 1893 (the worst financial downturn in the US up to that time), and thrived once again when the economy recovered. It was during the Panic that Horner admitted that new furniture, particularly his elaborately decorated works, was a “luxury” for Americans struggling to survive the financial downturn. However, he persevered serving both the upper and middle classes. Some of the “medium quality” forms he pioneered were partner (two-sided) desks, hall trees (hat/coat racks), and parlor sets (sofa and chairs). Horner’s was the first furniture store to establish a sales floor at the top of his building featuring complete interiors meant to give buyers design tips. This established a trend in furniture stores that survives to the present day. This secretary is remarkable in its restrained decoration and carving. That said, I still couldn’t see this in a regular middle class home, although its restrained amount of decoration may have qualified it for Horner’s “medium quality” category. Although it could be lumped under the umbrella stylistic term of “Rococo” or “Colonial Revival” that encompassed everything from Baroque to Louis XVI, often in lurid combinations in one piece, the secretary is actually quite a nice imitation of the Queen Anne style (early 1700s, England and America). It is a copy of a design by Duncan Phyfe (1768–1854), who worked extensively in the Queen Anne style. The ball-and-claw foot, cabriole leg with acanthus carving on the knee (yes, furniture parts are named after body parts), and the shell between the drawers are all part of Queen Anne decorative vocabulary. The original Queen Anne style was very restrained. The gallery rail along the top of this piece and mother-of-pearl inlay on the drop front are concessions to the 1800s abhorrence of a vacuum, i.e., decoration. Horner’s company moved to 36th Street and Fifth Avenue to take advantage of the trend of people moving north in Manhattan. In 1915 Horner merged his company with George Flint’s to form Horner and Flint. This piece still bears the porcelain plaque on the back with Horner and Company’s name. Studio activity: Design a luxury furniture item. Luxury means fancy; not necessary, but conducive to pleasure. Using a pencil, design a luxury chair. The elements of the chair, such as the legs, back, and seat need not be what makes it luxurious. Using color pencils or markers, decorate the chair in a fancy way that would make it difficult to relax while sitting on it. After drawing the decorations, make a contour line around all the shapes of decoration, and the basic chair itself, making sure not to draw any of the chair lines over the elements of decoration.